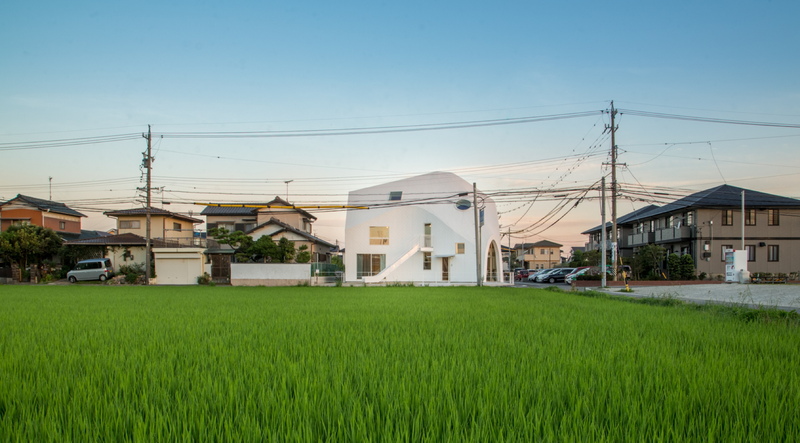 MAD Architects’ clients, siblings Kentaro and Tamaki Nara of Okazaki, had been running an infants’ school for many years adjacent to their home, a two-level house like so many others in Aichi prefecture. 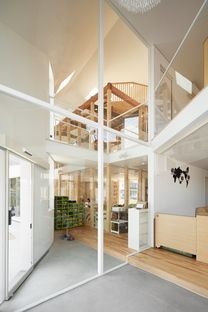 Now the old house has been transformed into a new structure called Clover House, and the Nara family no longer lives there, so that the kindergarten can make full use of all the space. 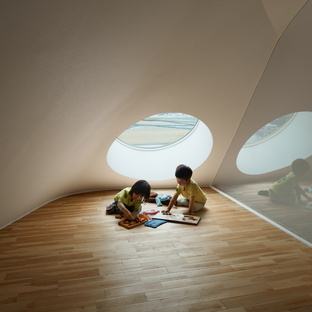 The need to enlarge the kindergarten because of increased enrolment led the Naras to decide to knock down the old home to allow MAD Architects to build a new school building. But Ma Yansong, a founding partner in MAD, recognised the importance of the old timber house. 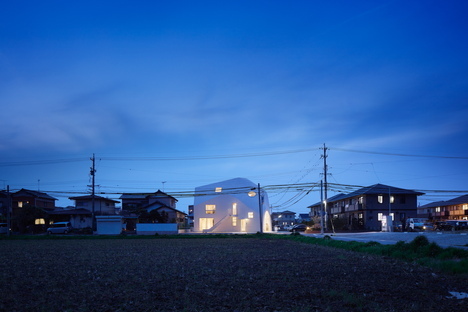 The old house had to be preserved as a symbol of the home-like atmosphere characteristic of the Naras’ method, to be passed down to the children who will be attending the kindergarten. It was not economically feasible to maintain and expand the home, so the architects decided to knock it down, but rebuild the orthogonal timber frame and part of the pitched roof to form the core of the memory of the home, around which to build all the annexed spaces where kindergarten activities would take place. MAD Architects’ project therefore consists essentially of timber pillars and beams left in view, retracing the skeleton of the old house, but without its infill walls, completely surrounded by a skin of plastic form which leaves room for a new area on three levels at the sides, grafted onto the old house to make use of the space thus created. The past and the present are connected but do not interpenetrate, maintaining a clear distinction that helps the children develop the concept of difference and functional differentiation of space. The two largest classrooms are located below the timber frame, while the interstitial volume contains smaller spaces such as the kitchen, bathrooms, smaller classrooms and a top floor office. 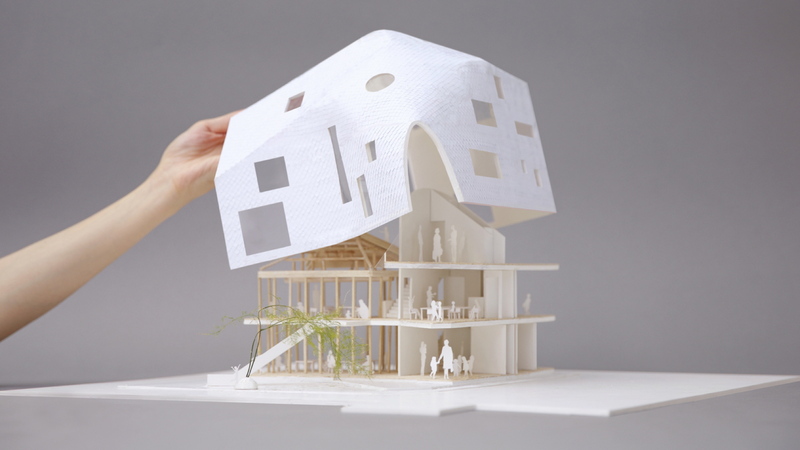 Observing the layout, the symbolic weight attached to the older building is clear, expanded with a white shell that shelters it while letting in a measured amount of light and a view of the outdoors. Glass walls and big windows permit ongoing dialogue with the outdoors, while skylights on the top of the building offer the children unusual, stimulating points of view, like eyes on the world. At the top of the structure in view, trusses support a series of wooden steps where a small library has been set up. Play and learning come together here, more than anywhere else, while the big window over the garden allows children to watch other children from a special point of view. The idiom of the shed roof is completely different from that of the timber frame inside, and there is no intersection between the two; one of them towers over and wraps around the other, with no continuity whatsoever. The outer windows pick up on those of the nearby buildings, and there is nothing like the white asphalt shingle roofing in the neighbourhood. The variety of the architectural idiom adopted by MAD generates discontinuity between spaces, creating stimulating spaces which are themselves educational tools for the development of creativity. In addition to these, the building features a number of entirely playful solutions, such as the entrance inspired by a cave or the big slide joining the first floor with the outdoor playground. 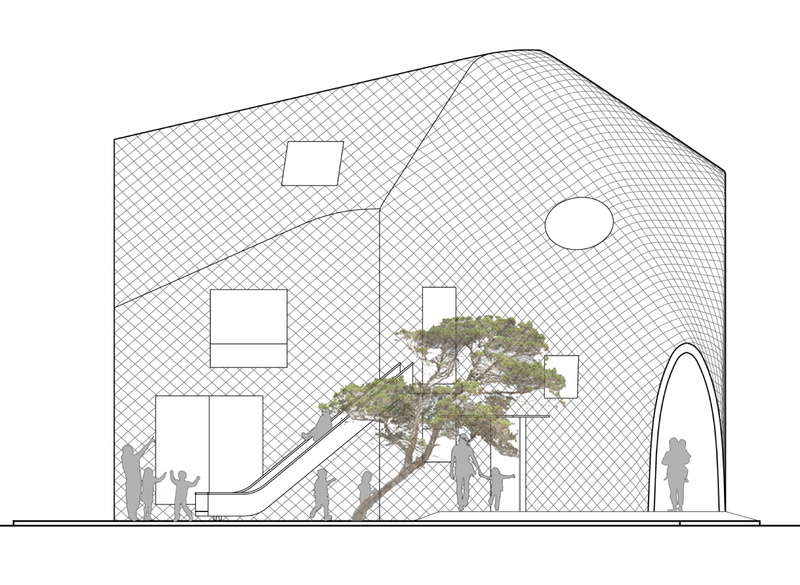 The prefabricated house with a roof with four gables that previously contained the school fit perfectly into its surroundings, matching them and declaring the building’s private nature; while the formal solution of a skin of white asphalt shingles, a design which is not based on right angles but is plastic, takes the project into a public semantic universe and makes it a landmark in the town and a part of the common heritage.